After separating from the first-stage core, the rocket’s two side boosters touched down safety at SpaceX’s Landing Zones 1 and 2 (LZ-1 and LZ-2) at Cape Canaveral Air Force Station. The Falcon Heavy’s central core then touched down on the “Of Course I Still Love You” drone ship in the Atlantic Ocean. During Falcon 9’s first launch in February 2018, the two side boosters landed successfully at Cape Canaveral while the central core narrowly missed the drone ship. Built on Lockheed Martin’s enhanced LM 2100 platform, Arabsat-6A includes several innovations that provide advanced Ka-spot beam communications services and Ku and Ka-band coverages in addition to other frequency bands. Arabsat 6A will be located at one of Arabsat’s orbital positions and will support Arabsat’s competitive position as the first operator in the region for satellite capacities and services. LC-39A at NASA’s Kennedy Space Center has a long and storied history dating back to the early 1960s. Originally built to support the Apollo program, LC-39A supported the first Saturn V launch (Apollo 4)and many subsequent Apollo missions, including Apollo 11 in July 1969. Beginning in the late 1970s, LC-39A was modified to support Space Shuttle launches,hosting the first and last shuttle missions to orbit in 1981 and 2011 respectively. Totally agree, Thomas. What I would really like to know is how the actual effort (cost) to re-use a Falcon 9 booster is comparing to SpaceX’s original theoretical projections. I know that it’s too early to tell yet, but, I would also like to know how that varies, if at all, when the boosters are launched in the Falcon Heavy configuration. Regards, Paul. Did you guys hear the control room voice saying “center core at deep throttle” at T+ 30 seconds? No wonder SpaceX dropped the idea of providing propellent cross feed for Falcon Heavy. That must make the stress between the center core and outer boosters very interesting! Cross tanking is a real issue. You have to support a mass flow on par with what the engine pumps are doing. That’s a lot of hardware. It’s much easier to throttle down, which given the landing requirement, you have to do anyway. So deep throttling has the effect of engineering major pieces of hardware out of the system. That was one awesome show. Have we seen the last of the high mass GEO birds use a throw away Falcon 9? Will Falcon H become a more common option for high mass flights to high orbits? If we see that, it’s a real world indicator of the economics of refurbish and re-flight vs throw away. That was a cool highlight reel! You can really feel the excitement. I love that view of the FH going up at about the 30 second mark of the video, like a big ol’ middle finger to OldSpace, MSF and their whole congressional contingent — all while launching right from NASA’s front lawn. What a vehicle. They gotta put a Raptor upper stage and a bigger payload fairing on this thing. I liked Musk’s idea of a mini-Starship upper stage. Get that upper stage reuse and kind of just complete the ultimate iteration of the Falcon family while getting real flight heritage for the Merlin and the stainless upper stage high velocity re-entry system. Did anyone see a calculation of the required dV to transfer from 200x90000x23deg to GSO? Is it smaller than 1800? When I heard they were going so high, I noted to check if they do a larger than normal plane change. The problem with a mini-Starship upper stage is you probably couldn’t do the elegant SpaceX propulsive vertical landing. The upper stage is too light and the raptor engine is too powerful. You would have to add specialized lower thrust landing engines? 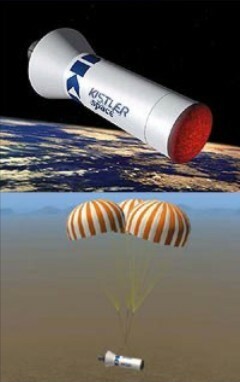 You could try the old Kistler K-1 Rocket idea of a forward nose heat shield and parachute/airbag recovery. It’s clunky and will cost some of the payload mass to orbit but at least there is a non-zero chance of reusing the upper stage and it might not be too expensive to implement. A more elegant solution might be a lifting-body shaped glider upper stage and horizontal landing. Something like the triangular X-33 might sit very appropriately atop the clustered three stages of a Falcon Heavy. The form factor of the X-33 seems made for such a triplet rocket. But where would the payload go? The payload would have to be a lot smaller than what fits in an ordinary Falcon Heavy 5 meter payload fairing. Because of the compromises (to say nothing of the cost of development) to Falcon Heavy performance, maybe the only thing a reusable Falcon Heavy upper stage might excel at is small satellites and propellant delivery to LEO. The problem with putting a lifting body on top of a rocket stack is that the asymmetrical aerodynamic forces twist the entire stack. 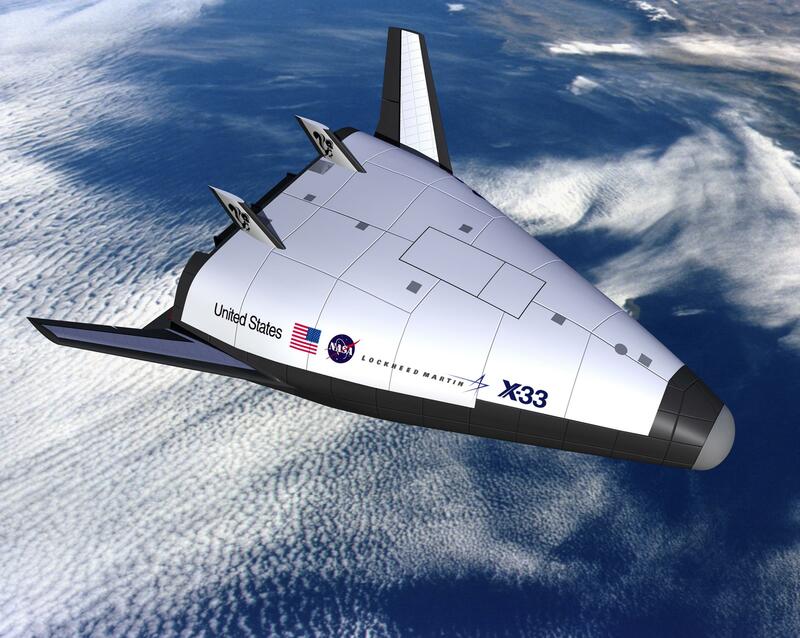 That is why the Shuttle Orbiter was side mounted and the X-37B is launched inside a faring. If a specific lifting body was designed for the Falcon Heavy upper stage, there is no reason it would have to be very asymmetric, like some lifting body types. It might even be completely symmetric. As for asymmetric aerodynamic forces, an ordinary Falcon Heavy is already dealing with strong asymmetric forces, so a triangular lifting body upper stage might help mitigate those forces. 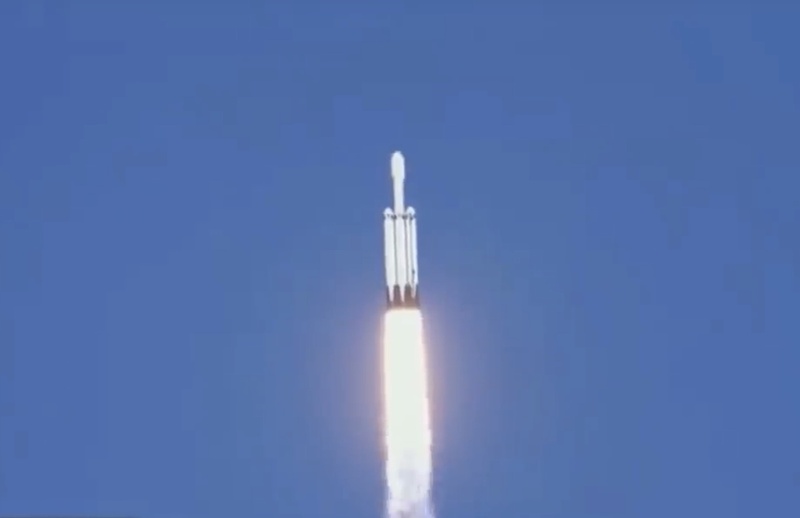 At T +30 seconds the Falcon Heavy center core throttles down, until booster separation at T + 150 seconds. So during that period most of the drag is on the center core which carries the 5 meter payload fairing whereas the vast majority of the thrust is from the boosters. The shear loads between the core and booster must be interesting, so no wonder the core stage can’t be a generic Falcon 9 like the boosters. But a new upper stage with a triangular lifting body shape could provide a fairing for all three lower stages, and also mate with all three stages, spreading out the aerodynamic forces and the thrust loads more evenly. You could then even use a generic Falcon 9 1st stage for the Falcon Heavy core stage. Get back to us when you figure out how to get rid of that last 10% of asymmetry. There are some wing shapes that are symmetrical . Aircraft in plan view are almost all symmetrical. Lift inverted with many aerobatic wings the same as normal when at the same AOA. In theory, it could be done. Whether it would work in the real world is a different question. And whether it would be worth the development $effort$ would be another question entirely. This is symmetry in one or two dimensions though, which may not be what you two are discussing.